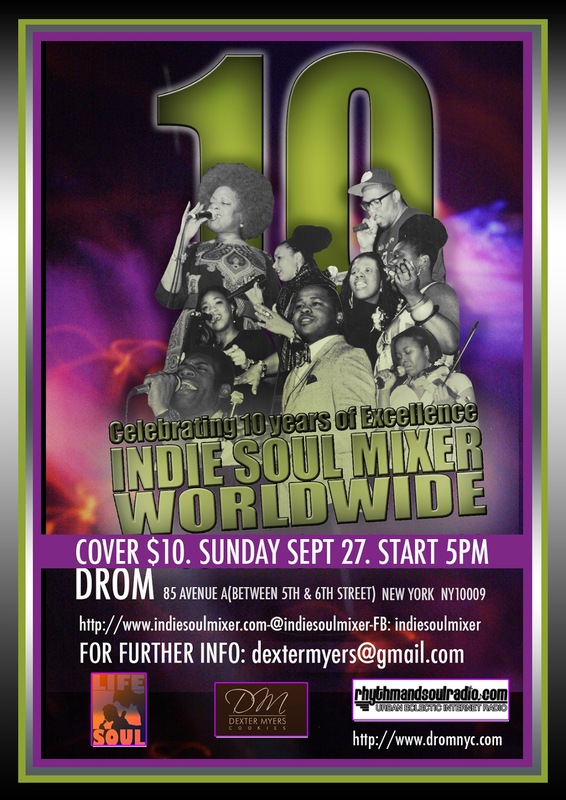 The 10th Annual Indie Soul Mixer-NYC presented by Executive Producers, Mike Ashley & Dexter Myers is set for Sunday, September 27, 2015. We are extremely honored to have produced this event for the past decade in NYC. We launched this event to offer support and camaraderie as the music business drastically changed around us. We invite our friends old and new to come out and celebrate a true staple in the Indie Soul Community. We are moving the event back to DROM, one of the premier music venues in NYC and we are trying it on a Sunday for this very special silver anniversary gala. 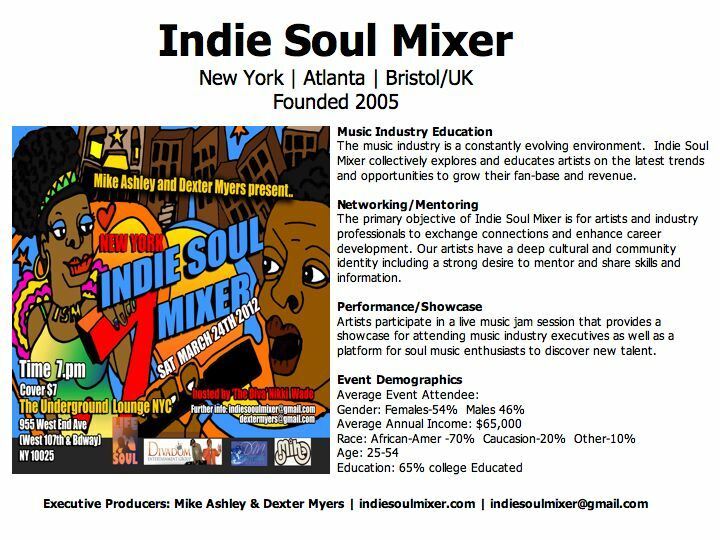 We invite every artist and guest that has ever attended the Indie Soul Mixer to come back and fellowship with us for this very important milestone. Whether you perform or just come out and experience the latest and greatest music from your peers, we want you in the building. If you would like to register for a performance slot at the event, please send us an email: dextermyers@gmail.com and we will send the performance information. We will always try to accommodate everyone that would like to perform and we are offering our advance payment option that will guarantee that those that pay early will secure a priority slot on the performance list for the evening! F train to 2nd Ave or 6 train (Astor Place) and R, W (8th St - NYU) train stations. This year we will have special guest DJ’s spinning your Indie-soul hits and Soul classics during intermissions and leading up to a Soul after-party. It’s all going down at Silvana for your convenience. The weekend continues with Sunday events hosted by DJ DAN C.E. and James Lewis and concludes on Monday at Marko & Melissa Nobles Injoy Enterprises “Rendezvous” at Shrine World Music Venue…. It’s All Soul Music…All Weekend Long!!!! We are returning to our roots for the world famous jam-session. There is no need to submit your music to our MD this year. All you need is three chords and the truth and the band will back you up… We are again offering an advance payment option that will guarantee that those artists that pay early will secure a priority slot on the performance list for the evening and their selected song placed on the DJ playlist for spins throughout the night! Reply to this email and I will forward you the performance specifications. 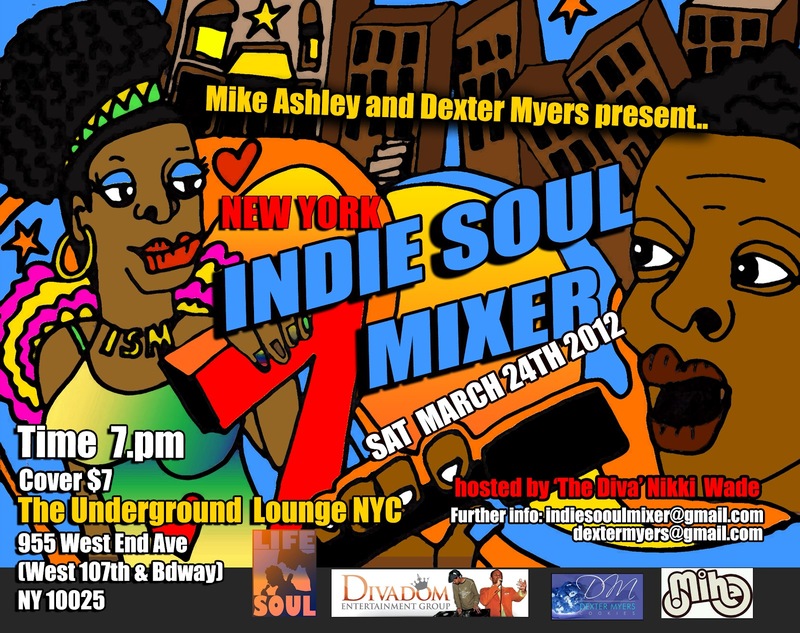 The 8th Annual Indie Soul Mixer-NYC presented by Executive Producers, Mike Ashley & Dexter Myers is set for April 13, 2013. We are extremely honored to have produced this event for over 7 years in NYC. We launched this event to offer support and camaraderie as the music business drastically changed around us. The music business continues to change everyday and we invite our friends old and new to come out and celebrate a true staple in the Indie Soul Community. We are moving the event to DROM, one of the premier music venues in NYC and we are re-mixing our program to keep things fresh! It’s simple…Music, Music and more Music. We will not conduct our panel discussions in the same format this time around. This year, we will start the program with our world famous Jam session and have a few brief announcements and presentations throughout the evening and mostly in between our amazing performances. It will be like Indie Soul Mixer meets “The Grammy Awards”… We will also offer a power networking technique that will allow one-on-one time with our power brokers if you so desire…That’s all I’m going to give you for now…you will need to show up to see what else develops!!! We are pleased to announce that Heshima & The Soul Journ will once again be our Musical Director/live band for the evening. If you would like to register for a performance slot at the event, the deadline is March 13, to submit your music. We will always try to accommodate everyone that would like to perform. However, this year we are offering an advance payment option that will guarantee that those that pay early will secure a priority slot on the performance list for the evening! Reply to this email and I will forward you the performance specifications. 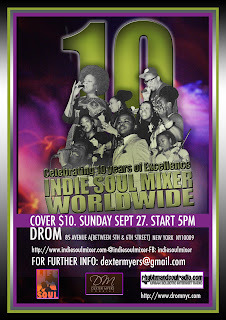 Atlanta, GA –The Indie Soul Mixer (ISM) is set to bring artists from all over the world to New York, Atlanta and London in 2013 for a celebration of independent soul music and it’s creators. ISM Founders Mike Ashley and Dexter Myers launched the event in 2005 to help Indie-soul artist develop their brand through networking, education and performance opportunities. The mixer has become the most anticipated independent soul music industry event and promises an exciting roster of special guests to attend in 2013. The 2012 Indie Soul Mixer Atlanta is officially cancelled in an effort to focus all planning and resources on making 2013 the most successful year ever in all three markets. “These are still very tough times in every segment of the music industry. Our guests expect us to deliver the latest insights and strategies for success in the music business. We are restructuring to insure that we continue to produce a high quality event that unites music executives and artists with the goal of sharing strategies to excel in the increasingly challenging music market,” Myers and Ashley said. 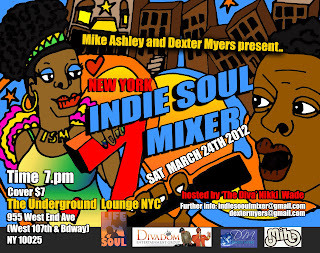 The 7th Annual Indie Soul Mixer presented by Executive Producers, Mike Ashley & Dexter Myers is set for March 24, 2012. We are extremely honored to have played a part in uniting the Indie soul community for 7 years in our flagship city-NYC. We launched this event to offer support and camaraderie as the music business drastically changed around us. We are still here after all of these years and the music business continues to change everyday. We invite our friends old and new to come out and celebrate a true staple in the Indie Soul Community. As always, we will share the vast knowledge of the established artists and industry professionals that frequent our events. The One and only diva, Nikki Wade will be our hostess for the evening and we welcome Heshima & The Soul Journ as our Musical Director to accompany our impeccable Indie Soul artist performances.